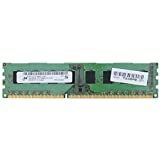 MICRON MT16JTF51264AZ-1G6K1 4GB DDR3 PC3-12800U-11-13-B1 240PIN NON-ECC 2Rx8 DESKTOP MEMORY MODULE. Memory type: DDR3 SDRAM. Capacity: 4GB – Bus type: PC-12800 – Form factor: 240 Pin – Error correction: Non-ECC – Cycle time: 1.5ns – Cas Latency: CL11 – Data transfer rate: 1600Mhz – Memory clock: 200Mhz – Voltage: 1.5.